Well, buckle those seat belts tight, ‘cause I’m bringing you some pretty heady stuff here. But, we’ll get through it together just fine. I want to discuss something known as the HPA axis. This physiological interrelationship is of major importance to panic sufferers, so I’m going to get into a good bit of detail. The HPA axis involves the interaction of the brain structure known as the hypothalamus, the pituitary gland (just below the hypothalamus), and the adrenal glands (at the top of the kidneys). These three pieces of anatomy work together to regulate functions and states, such as stress response, mood, digestion, immune response, sexuality, and energy usage. Now, to really capture the purpose and functioning of the HPA axis one needs to become familiar with a little bit of physiology. It may appear complicated, but hang in there because it’s really important. Also referred to as corticotropin-releasing factor (CRF), it’s produced and secreted by the hypothalamus and deeply involved with our autonomic and behavioral responses to stress. CRH stimulates the pituitary gland to secrete adrenocorticotropic hormone (ACTH). Scientists have strongly suggested the biochemical fallout of CRH hypersecretion is a major factor in depressive presentations. And though studies have yet to produce evidence showing consistent changes in CRH concentrations in the cerebrospinal fluid of panic sufferers, preclinical research indicates such evidence may be just around the corner. Secreted by the pituitary gland, it stimulates the adrenal glands to ramp-up production of the mineralocorticoids and, of particular interest to us, the glucocorticoids. Produced in the adrenal glands, this family of steroids is necessary for the regulation of energy metabolism, as well as immune and inflammatory responses. Cortisol is responsible for the vast majority of glucocorticoid activity. Produced in the adrenal glands and referred to as the “stress hormone,” this glucocorticoid is best known for ramping-up our physical response to stress. Motivated by stressors such as distressing life-events, trauma, excessive exercise, anxiety, and depression, cortisol preps us for action by stimulating norepinephrine (noradrenaline) to flip the switch on our fight/flight response. Obviously, situational secretion of cortisol is natural and necessary; however, when it’s secreted in the presence of chronic stress, all sorts of icky consequences may occur, like high blood pressure, hardening of the arteries, diabetes, immune system inhibition, muscle atrophy, and osteoporosis. Now, the HPA axis is big on feedback loops. What are those? Most any system, biological or otherwise, has input and output capabilities. When the output of a system in some manner loops back to the system as input, and influences its functioning, a feedback loop has been established. A positive feedback loop increases system output, a negative feedback loop decreases it. As it pertains to the functioning of the HPA axis, just as cortisol stimulates the activation of our fight/flight response, it also initiates a negative feedback loop, sending a signal to the hypothalamus and the pituitary gland to chill-out and relax. Well, as we consider the flow of the HPA axis, this serves to inhibit the production of CRH in the hypothalamus and the production of ACTH in the pituitary gland, leading to stable levels of cortisol. It also reduces noradrenergic (having to do with norepinephrine) activity, making us less anxious. So really, this is all about a cortisol checks-and-balances system, and given the negative impact of chronically hypersecreted cortisol, that’s a good thing. But never ever forget about the positive feedback loop created as cortisol signals norepinephrine and epinephrine (adrenaline) to get busy, because the result will be increased production of CRH, ACTH, and yet more cortisol. Just what the doctor ordered, right? Oh, our fight/flight response will be switched on as well. You think all of this may trigger a bit of panic? Now, in so-called “healthy” individuals the noradrenergic system and the HPA axis work in harmony through, as we discussed, feedback loops, in maintaining a sense of stress-balance. When everything is operating as it should, as activity in the noradrenergic system increases, activity in the HPA axis follows suit. But in panic sufferers this delicate balance is interrupted by chronic and/or situational overproduction of norepinephrine, which messes up the whole works. 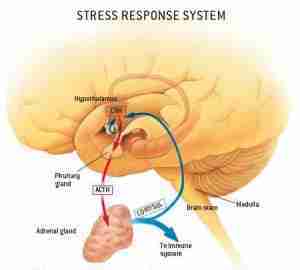 As a result, the HPA axis becomes cut off from any and all noradrenergic activity, leading to an unmanaged increase in stress. The term dysregulation refers to the inability of a neural system to maintain a balance of its intended neurotransmitter activity. If you haven’t caught on as yet, noradrenergic activity in panic sufferers is theorized to be highly susceptible to dysregulation because of all of the funny business mentioned in the last paragraph. Most are aware of the success of the antidepressants known as selective serotonin reuptake inhibitors (SSRI’s) in the treatment of panic. Well, this success may well be due to normalization of a “dysregulated” noradrenergic system by the enhancement of serotonergic (having to do with serotonin) activity. Remember, as serotonin levels rise, levels of norepinephrine fall.